Follow the 2011 Third World Eye Care Society's trip to Chinandega, Nicaragua. A few days have passed, giving me time to fully contemplate the impact the TWECS Nicaragua project has meant to me. As many of you know, this is something I have wanted to become involved with for a number of years. The days in clinic far surpassed anything I imagined or hoped for. Firstly, I'd like to thank the entire team for working together so beautifully in providing the gift of sight to the people of Nicaragua. I commend you all for your hard work and dedication. I can certainly say I am better for knowing each and every one of you. Secondly, I'd like to thank the people of Nicaragua, for none of this project would have been possible without them--from the translators, to the Bomberos, to our partner Gerry, and many, many more. A true display of working together in this world for ultimate good. We are, after all, all connected. And above all, a special thank you to Dr. Marina Roma-March and Derrick March, Founders of TWECS. How do you truly thank those who infinitely change the outcome of one human beings life? And continue to do so globally for thousands upon thousands on our beautiful planet. We are preparing to leave Monty’s Surf Camp and head back to Managua. Our work is done and as always this is a time of reflection. This is my 4th eyecare mission and different in many ways to previous ones. I found myself feeling the responsibility of organizing the initial stages of registration and VA (visual testing); especially after Marina left. I realized we could examine and provide for as many patients as we could process through these early stages by the cut-off time as there was NOT a shortage of people in need. So I spent most of my time in the VA station, not really what I had envisioned…..as an Optometrist I thought retinoscopy, ophthalmoscopy, special testing or prescription writing was my role. I also did not spend much time in dispensing and experiencing the wow factor (when patient’s put their glasses on for the first time.) However, in looking back, this was no less an emotional roller coaster ride. Memories that come to mind: asking a young man to point to the direction of the tumbling E’s and realizing too late that he had no fingers. Just speaking of “feeding” the children at the garbage dump brought tears to my eyes. The woman who thought that all she needed was to have her closed lid raised and her vision would be restored. I had to dash her hope and explain that because she had her ptosis(lid droop) at birth that her eye had never had the opportunity to develop clear vision. I learned once again this mission the importance of just buckling down and getting things done…sometimes it means taking on unexpected roles. This project was a splendid TEAM effort and an outstanding success as a result and I am so proud to be a part of this Nicaraguan eyecare mission. The sun is just about to rise. Monty's staff is already cleaning up from the "Partye". It is very peaceful and time to reflect on the past week. What I say, I hope, will not be taken the wrong way. On day 1 of the clinic the attitude of the new first time people tended to be "each man for themselves"… look for it yourself attitude. The I am busy fixing the world, putting out fires. But, by day 5, the whole attitude of the team had changed! Gone was the I am too busy… now was the "uno moment, Rodger. I will help you," The "I" had changed to "We." People changed form strangers to Family. Our team took off their "masks" and let down their "guard" and the "real" started into a well oiled machine. It was beautiful, gods people helping gods people… I will be back again. A perfect end to a perfect project. Our last day of clinic in Nicaragua was amazing. We arrived early in the morning, expecting to see absolute insanity. The opposite was true. Our security team, the Chinandega Firefighters had spent the night at Red Cross Headquarters (our clinic location) ensuring that order was kept. The first patients started lining up at about 1:00am to ensure they would be seen. By about 3:00am a substantial group had formed yet order was maintained throughout the night. When our bus pulled in at about 8am, there were approximately 600 people lined up down one city block, around the corner down another block, around one more corner and starting down a third block. It was a pretty impressive sight. For those whom have never been on an international project I will give a brief description of what a patient would experience…. A patient would arrive at the clinic in the middle of the night. They would stand in line for about 8 hours in eager anticipation of their first ever visit to an Optometrist. At around 8:00am the majority of our team would head out in the crowd and start the registration process. Every person would receive a form that would be used for entrance to the clinic. On the form we would record the patients name, age, basic medical issues, any issues with vision and their occupation. With this form they would then proceed to the Visual Acuities or V.A. station. Here the patients ability to see near and far would be quantified. This is the test you will recall form your Optometrists office. The chart with the large letters on top diminishing to the smallest letters on the bottom. There was a slight difference to this test in Nicaragua. Due to the high illiteracy rate with many older people letters could not be used, so the test consisted of symbols that pointed up, down, left and right. It was amazing to be able to quantify someones vision with a simple test and only a few words. Next, the patient would enter the Red Cross HQ for further testing. A quick test with an auto-refractor (AR) was used to determine the next step. The AR is an instrument that can determine a persons prescription. This is a very rough measurement, but is quickly zero in the focus of further visual testing. After AR, patients would go to one of three stations for further examination to check the health of the eyes, to refine the patients prescription, and to be counselled on any visual issues they may have. After the patient had the prescription in hand they would proceed to the dispensing area. This is where the TWECS magic really can be seen. The dispensing team would take the Doctors prescription and find the appropriate glasses out of the 10,000 pairs that were packed from Canada. Once these glasses were placed on the faces of many visiting the clinic, a whole new world was revealed. Most had never had glasses before. Many had never seen further than their hand so needless to say the reactions from many were priceless. They ranged from a smile, to patients breaking down in tears. One little boy was actually frightened to see the real world. From dispensing the patients would fill out an exit survey with the help of interpreters and be on their way home to enjoy their new life with vision. This was a monumental trip for all those involved and I for one will be travelling with this group again. I am also putting out a plea for help. If you have an old pair of glasses, please donate them. If you are looking for christmas gift ideas, make a donation to the amazing work that TWECS does in someones name. What could be a better gift than changing the outcome of someones life? That is not going to happen with a Starbucks gift card. If you have never been on a project before, please, please get involved. Travel with the team. Donate your glasses. Help out at the TWECS glasses warehouse in Burnaby. Make a monetary donation. I have seen first hand that this group is making a dramatic impact on the globe we share and with your help it will continue for many years to come. Say tuned for the final numbers of the 2011 Third World Eye Care Society's Nicaragua project. Wow, what a ride today. I knew that the clinic in the city of Chinandega would be busy and we were not disappointed. Our clinic location for today and tomorrow is the Nicaraguan Red Cross Headquarters for the Chinandega area. When we arrived the street was cordoned off by the police and was filled with people desperate for eye glasses. Hundreds of people filled the narrow street. And house of the Chinandega Chief of Police was right in the middle of all the excitement. Perhaps that explained the police presence? Many of the people in the street had never seen an eye doctor before and will potentially never see one for the rest of their lives. So needless to say there was a motivation to be registered for admission. To give this situation a Canadian perspective, walk into a street crowded with hundreds of people and start handing out cheques for $100,000.00 and ask them to please form a single line and to wait their turn to receive the money. That may cause a slight commotion; as it did today. The cost of a quality pair of glasses in Canada could be about $300.00 which is the equivalent of 2 years salary for many in this area. So if we were to use the same ratio in Canada a free pair of glasses would be worth $100,000.00. Scary huh? 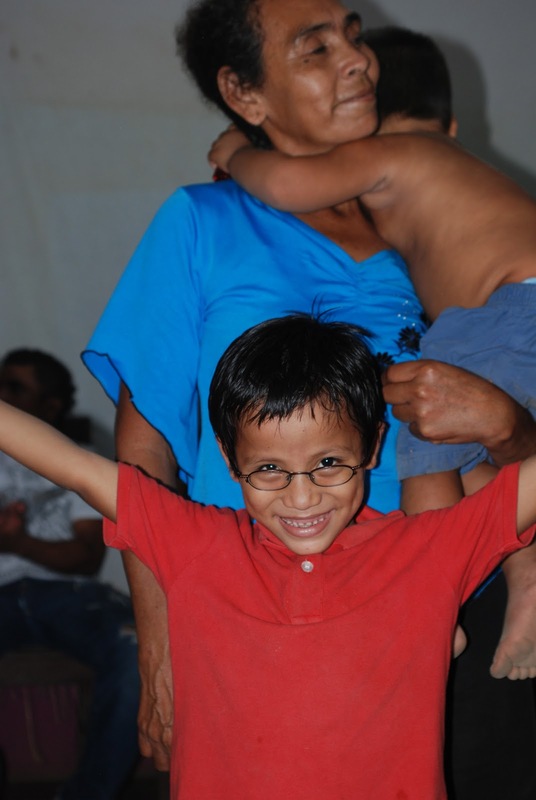 Today we saw almost 700 patients with over 500 of those receiving at least one pair of glasses. Many received a pair to aid their near vision and a second pair to help with their distance vision. I have been on several projects before but I have never seen the reactions as I did today. Over 20 people came up to my wife Sue to give her hugs and kisses. These are people she has never seen before in her life and they cannot contain their feeling of gratitude. I was standing next to Rae, another team member when a small boy jumped up to give her a kiss. I had to grab a camera to capture the moment and he had no problem to keep giving her kisses every time another camera came out to capture the moment. Many more people were elevated from legal blindness to near normal vision. Just another day for a TWECS project. The one story I will elaborate on tonight is that of a young boy Christopher. This little guy was amazing. He was about 7 years old and the youngest of 5 children. 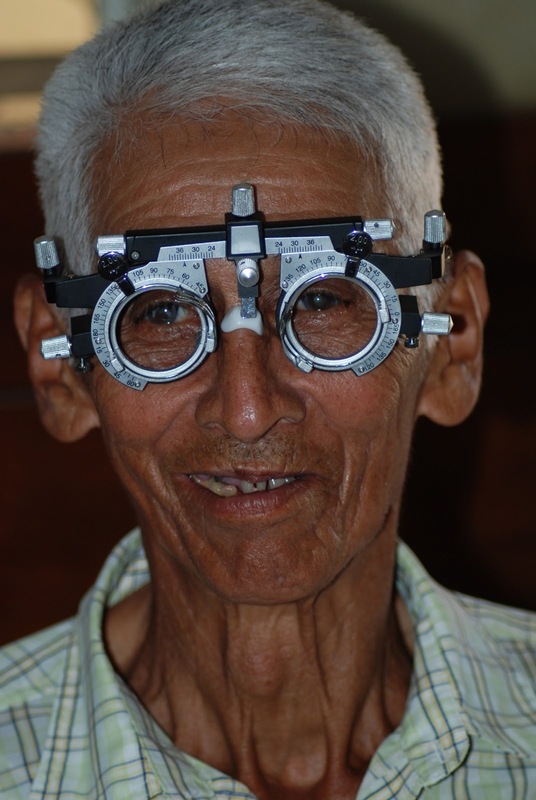 He received glasses that took him from a complete inability to function in his community to near normal vision. He was given his life changing specs and couldn't have been happier. Derrick also gave him a second pair of glasses as a backup incase the unthinkable happened and his glasses were broken. Also, a third pair of glasses were dispensed to Christopher with a prescription that would work for him in about 2-3 years from now. Very cool, but what really touched me was what happened when he left the clinic. I walked Christopher and his Mother out of the hospital and on their way back home. Christopher stopped and pulled his mothers ear close. He said something in Spanish that I did not understand. Mom spoke to me in very broken english and said that Christopher wanted permission to go back through the crowds and re-enter the clinic. He needed to personally thank as many team members as he could. How could anyone say no? I held his hand and walked him to as many of the doctors and volunteers as we could find. He had smiles, hugs and many "Mucho Gracias's" for all. This was obviously a boy who knew how fortunate he was to regain his vision, despite his young age. Not a bad day. Tomorrow is the last day of clinic in Nicaragua. It will be an awesome day. Those who were unable to get in today will certainly be lining up very early. Also the word has spread that free glasses are available to those who show up tomorrow in a town of 140,000. I anticipate pandemonium tomorrow at registration. Our host Gerry summarized the day in a few words… "It will be a machine gun day tomorrow" meaning the police will have to supervise the massive crowds. I will keep you posted, but don't expect an early blog update as we are heading straight to a celebratory dinner and thank you ceremony to all that have helped make this trip a success. Today the entire crew worked at the El Viejo Hospital. Our day started at 7am and we finished at 3:30 pm. We saw about 730 patients. I worked all day inside a 10m x 10m tent taking visual acuity's. Doing this gave an excellent opportunity to talk with the patients. I asked them quite a few questions. Obviously they did understand me, since in most instances I did get very elaborate answers. I do believe that I am starting to understand some spanish. I had a great day and I am looking forward to tomorrow. Today I leave my team behind to travel home. It is the first time in 16 years of TWECS work that I have had to leave a project early . Circumstances at home and business would not allow me to stay for the full project. I left the team with mixed emotions and bittersweet feelings. I was happy to be going home to Evan and Emma. Everyday, I hear in their voice how much they miss us, and as 9 year olds, they don’t fully understand the work we do, they just know that Mommy and Daddy have to leave again, sometimes for 21 days sometimes for 10days, but it always feels like an eternity to them. It was difficult to leave this team. Many of them I met for the first time just 4 days ago. The long 3 hour bus ride from Jiquilillo on their arrival, proved that this team of 27 were no longer strangers and it was wonderful to be with them and witness the camaraderie. I was impressed by their drive, their enthusiasm and determination to work hard as a team. Thank you team Nicaragua for making the sacrifice to travel with TWECS and to join this project. 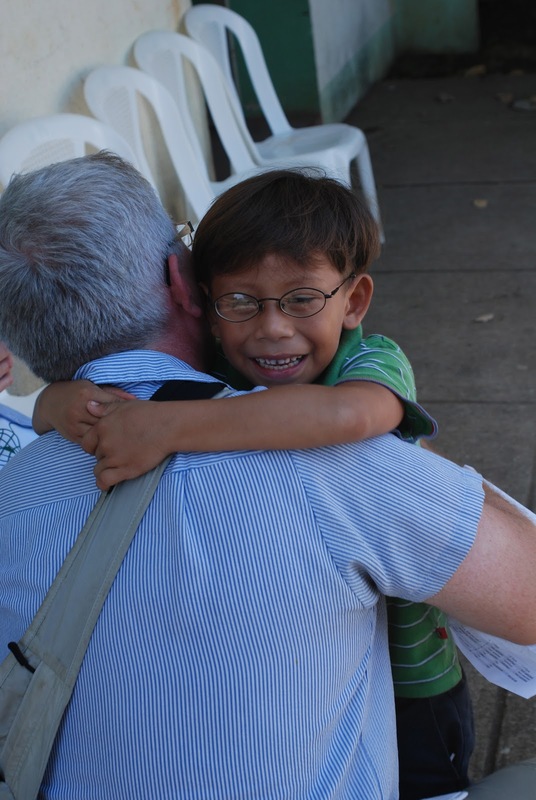 I know you will make a difference to thousands of Nicaraguan people simply by being there and by a pair of eyeglasses. Many of their faces and smiles will be etched in your hearts forever. I wish I could be there to share the workload and the sweat with you. I will especially miss triage with Brad whose one liners always relieved my aching feet. And of course I leave behind my better half, Derrick , the mastermind of TWECS. See you soon Sweetie! I really enjoy the updates! Keep them coming. Gerry, you are one of a kind. You have wowed the team with your charm and you made a “Gerry Believer” out of me. We simply could not have accomplished anything without all your efforts. I look forward to working with you again for another TWECS project! Keep practicing those cha cha steps. Well here I am again. Trip number 3 with TWECS. As usual a ling flight and bus ride to our destination of Chinandega! A bus ride reminiscent of Vietnam, long and dark with a minor mishap along the way. Arriving at our accomodations at 2:45 am. Short sleep and off to see some sights, the kind we never see at home. Children and families living in a refuse area where there is constant burning of refuse. Unhealthy to say the least. This is where we will set up clinic for thursday and friday. The first day of clinic it all came back to me, the set up, the routine, the different stations and the gratitude of the children we were serving. This third trip is not much different then my first two, great team, great camaraderie, and great rewards from the happy faces leaving clinic with their new glasses. Today we saw 700 plus people and with 2 days to go it will be a record week! Will I be back for a fourth tour of duty? You bet. ASAP. I am so proud to be part of the TWECS team. We have finished over half our clinic days and what a wonderful experience! I love to see the team working so well together. I love to see the patients getting glasses to improve their vision. And I love being part of the whole process. I am looking forward to our last two clinic days and I am confident this won't be my last TWECS trip. Is day 3 of clinic really over? I can’t believe we’ve surpassed the halfway point of the project already. Today was the definition of ‘organized chaos’ and it was also the first time on the mission (so far) that I shed a tear. We’re more than 2 days and 1,200 patients in so, understandably, inventory in certain prescriptions is running low. Trying to fit a female patient with +5.00 readers that looked like something Dame Edna would wear, was becoming quite upsetting (for all involved). I had managed to get them on her face without her seeing them (obviously) and they worked like a charm; they were exactly she needed! Unfortunately, as soon as she realized what they looked like, she could no longer see with them. We know what that means. I totally get it, I totally understand that they look a smidge ridiculous but they are absolutely ideal and there’s nothing else that would work more perfectly for you. We have both come so far for you to receive what you need; please don’t refuse. If there was anything more I could do, I would. I promise. Thankfully, she left with the glasses. Just a couple of minutes pass, I see one or two more patients and I then approach another female with a similarly high prescription. I know what it is we have available for her and I get a bit of a sinking feeling. I go fish her another pair of Dame Edna’s and place them on her face (before she had a chance to see them) and… PERFECTO! They work! Muy bien! My patient pulls the glasses from her face to take a look and clutches them to herself. “Gracias! Gracias!” She is so happy. She’s able to read again. She is absolutely thrilled, she doesn’t care how they look and the smile on her face brings a lump to my throat and tears to my eyes. I am so glad that we both came all this way, for this moment. Bellisimo. Today we were able to see patients at 3 Elementary schools: Padre Ramos Elementary, Los Zorros Elementary, and Jiquilillo Elementary in the morning with two small screening teams. The bulk of the TWECS volunteers spent the day at the Theodore S. Kin Hospital and saw 597 patients. Today over 320 pairs of glasses were given to those most in need. The project saw mostly farmers, fishermen and housewives. Of the people seen today the average annual income was what most people in Canada will make in a week, so needless to say, glasses are not easily afforded by most. The patient who had the greatest impact on me today was 8 year old Alexande. This bright young boy had a few problems in his life. He was afraid to ride a bicycle. He was not able to understand his lessons in school. He had few friends as he was not able to play any sports without falling. All caused by his near legal blindness. Today his mothers prayers were answered. Alexande was registered late in the morning. He went through several screening stations and was examined by several doctors. By 2:30 pm he had made it to the dispensing station where Derrick had selected 3 pairs of glasses. The glasses were placed on his face and his expression was priceless. He was in disbelief that a world actually existed beyond the 6 inches in front of him. He just focused straight ahead for a few seconds then the most beautiful smile crossed his face. An 8 year old boys life was changed forever. In the 2 seconds it took to place those glasses on Alexande’s face he had gone from a life of despair and reliance on others to having a productive and meaningful future. If we were to pack up and go home tonight I would rate this project a 100% success as a life was forever changed. Fortunately, we still have a clinic day in El Veijo tomorrow and 2 more days in Chinandega. Hopefully we will see more Alexandes. My second day doing clinical work in Jiquilillo, I found very challenging. In the morning a group of us went to the Padre Ramos Elementary School. I was completely astonished to see the poverty that the school was in. However, every child that I saw was healthy, happy and very intelligent. I only found 2 annoying visual problems: 1. An 8 year old girl who is hyperopic. 2. A 17 year old boy who is myopic. This is out of about 80 children. Afterwards our team headed back to the hospital. There I was devastated when I saw a 5 year young little girl. Accompanied by her grandmother who recently has been operated on for congenital cataracts. The operation was not successful. In her right eye the intraocular lens fell out of place and there was dense secondary clouding on both intraocular lenses. She will need to undergo more surgeries to have this problem fixed. I can only hope for the best. Good evening all, Thank you for checking in. What can I say? Today is what months of preparations, time away from family and a major financial commitment are all about. We were able to dramatically touch the lives of over 700 people today. The team was split in two today to cover as much ground as possible. One division went to the Mother Theresa school in the morning, and the other spent the entire day at the Theodore S. Kin Hospital location. Setup at the School was a breeze a the majority of team members were veterans. The clinic was registering children from pre-school to grade 11 within 10 minutes of arrival. It was an amazing experience as the children were some of the most well behaved and respectful I have ever met. Within about 4 hours over 360 children and teachers were examined. For those requiring a pair of glasses, their info was taken and the prescriptions will be made up on wednesday and delivered to the children the following day. In the hospital location things were a little more hectic as there about 250 people waiting as the team arrived at the hospital entrance. The setup took slightly longer than the school as a dispensary had to be built. Not a problem for this team, as the cohesive group put their heads down and accomplished the goal of starting to see patients in a very short time. The day went very well and the patient flow was a busy yet manageable pace. Dr. Roma-March had a very interesting lady as a patient. She was a seamstress but had to give up the profession as she could no longer see and was unable to thread the needle. It is a terrible thing to say, but she had now become a burden on the already struggling family. With her income they were able to scratch out a meagar living. Without the seamstress' income the family was facing severe hardship. She was so desperate for some help she had brought a thread and needle in to the clinic to facilitate the translation of her dire concern. Not a problem for Dr. Roma-March and the TWECS Team as hundreds of people with similar problems were seen today as an eye exam and a pair of glasses resolved their problems. The seamstress said she will return home this evening and return to work after years of an inability to do so. Brian, excited about his new specs. Today has been amazing. It really is hard to find the rights words to explain the overall feeling you get from helping so many people. So rewarding and exhilarating. TWECS is first class! Marina and all the key people are so organized, very well run. I really feel so fortunate to be here and a part of such a rewarding project. Great group to be spending this time with. I was up this morning at 5:15. I had a very good nights sleep. Very relaxing listening to the rolling waves. Had breakfast around 7:00 and left for the hospital around 8:00. When we got there we were a little confused and it took about an hour before things were organized. The hospital staff were very cooperative and helpful. There were patients of all ages gathered in the central area of the hospital. Eventualy I was assigned a room where I was able to set up my examination routines. I was very fortunate that I had the help of my translator. His name is Jesus, and he is 17 years old. I had the false impression that I would be able to manage in Spanish. I realized how much I need to learn. The patients would come to the examination room 3 at a time with a line up outside. My duties consisted of performing ophthalmoscope, retinoscopy, and writing a script. Most patients that I saw were able to correct their vision adequately, however there were a few elderly patients that I could not help out, due to the fact that they had advanced cataracts. All patients that I saw were very appreciative, polite, and well behaved. I am looking forward to tomorrow with great enthusiasm. Team Arrives in Nicaragua Tonight. 1 Day prior to Team arrival.